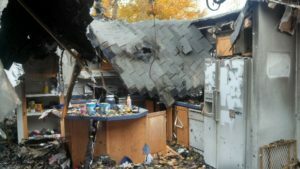 The procedure of fire restoration after fire damage has occurred in your Las Vegas property can be greatly overwhelming for many of us. Many homeowners will be devastated from fire damage. One thing that can offer some peace and comfort to you and your family after a disaster is knowing you have the right professionals to get the job done right. Business owners and homeowners may be in shock from the fire damage devastation that just occurred. However, you still need to keep in mind the proper steps to make sure the restoration process gets done the right way. Many restoration services have the necessary training, safety and health certifications, experience, and also the required and proper licenses needed to get the job done right. Before hiring a restoration company, be sure to check all references in your area to help obtain the best price quote while getting the job done right with fire damage restoration. The first thing you should do is to clean up as much of the existing areas as possible. Soot residue can leave permanent damage to items and areas that are not immediately cleaned. If you decide not to hire someone to do the initial cleaning, then it is important to know these steps. When you begin cleaning, be sure to always use a dusk mask and open windows if you can to help allow for proper ventilation. Wash items that are wash safe, or even have the items dry cleaned. If you have access to a power washer, you can begin spraying down the outside of the home to remove the soot as well. Keep in mind that performing soot cleanup on your own can cause damage to your respiratory system and extensive damage to your property. You risk greater damage to your home if immediate clean up has not begun. Within a few minutes after fire damage, smoke and soot will begin to discolor your items to a yellowish color. Within a few hours, the acid will begin to stain many areas of your home or business. Within a few days after, your walls will permanently be discolored and some of your items will begin to rust. After a couple weeks without cleanup, the chance of being able to restore items from the fire damage will be little to none. This is why it is critical to contact a professional restoration company to get the job done. The longer the smoke lingers in your home, the harder it is to remove the odor in the fibers of your items. Professionals need to be called immediately to remove the smoke and residue odor at your Vegas property. The professionals can remove the source of the smell and clean any items that may be salvageable. Now that you have been educated in the fire restoration process, you now can help minimize the cost of the repair that’s needed. Hiring professionals ASAP can help return the property as if the fire never happened. With hiring professionals, you can also have peace and comfort during an event like this knowing that your property will be handled with care and returned back to normal.